We want to hold VPN services accountable. This means our testing methods are quite extensive – the most extensive in the industry, actually. Other VPN reviewers may only go over the surface-level contents, but not us. We take things to the next level. Here’s our full review process. If you think we can improve on it, please let us know! By using the same computer and network, we have some base numbers to work with. A control device and network provide relatively stable numbers so that our tests have less outside (fluctuating) variables to work with. We’ve tried out different ISPs and packages to test the VPNs. We wanted to test with realistic numbers that real people like you and I can relate to. Naturally, we settled with a stable 100/100 Mbit connection allows us to really push the speeds of the VPN servers while it’s a more realistic speed that people can relate to. Unbiased means we don’t use test accounts given to journalists. We buy subscriptions out of our own pocket. Sometimes we may opt-in for the free trial to see if they will charge us. This tests if they will use underhanded tactics to charge unknowing customers. One thing is for certain: we never accept bribes, “donations” or any other kind compensation for “better” reviews. Rest assured, all tests are done in-house. All data is collected, saved, and compiled by us. We do check other reviewers and user reviews to cross-reference our datasets. With a control device and connection, we can reliably run speed tests. The VPN speed is an important factor that many readers consider before buying any subscriptions. This affects whether your YouTube streams will be smooth or not. It also affects your download/upload speeds during torrenting. Not all VPNs were created equal. Some VPNs had awful speeds, some were decent enough to pass most tests, while others provided high-tier gigabit networks. 4. Security Test – IP Leaks? As we always say, a VPN is your first line of defense. 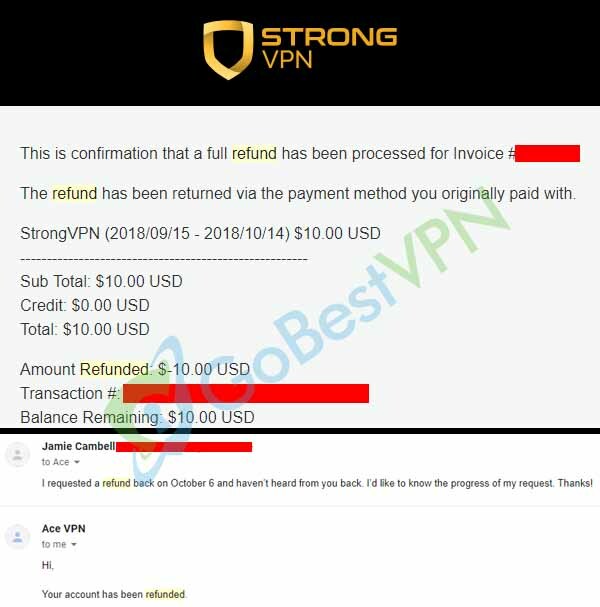 When a VPN is leaking your information, including your IP address, they are leaving you vulnerable for attacks and lawsuits (if you are torrenting licensed content). 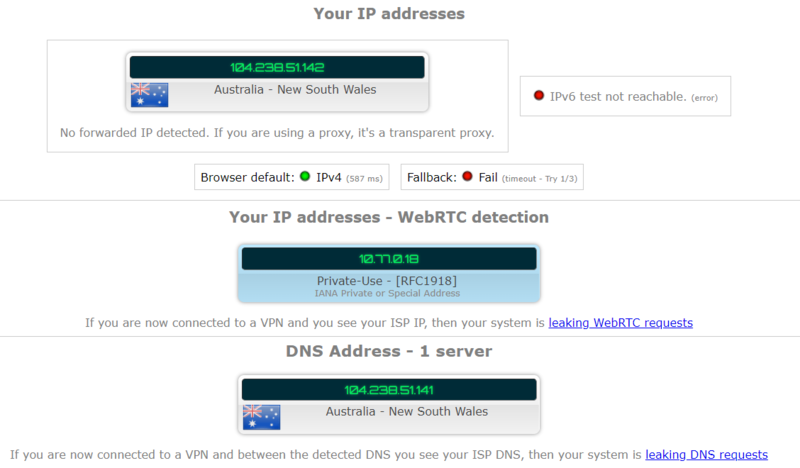 Some VPNs offer IPv6 support as well. Simply having IPv4 protection isn’t enough. 5. Security Test – DNS Leaks? On top of your IP, your Domain Name System (DNS) must be protected. Keeping your DNS secure is one way to make sure that your Internet Service Provider (ISP) won’t snoop on your activities. A VPN may advertise that they have every leak protection but as we can see from the picture below, DNS leaks are a real problem. 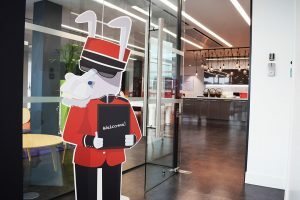 Believe it or not, a large portion of our readers want a VPN for the sole purpose of accessing geo-locked content; Netflix, BBC iPlayer and YouTube being the top three streaming platforms. Governments around the world also have some draconian laws – take China for example. They’ve recently banned Twitch. We can hope that there will be a completely free and unrestricted Internet one day, but until then, we will hold down the fort and keep on testing. Look out for this picture in our reviews – it’s the green light for Netflix. Find the best VPNs for Netflix here. Today, millions of people torrent to share files among their peers. One staggering statistic we have for you is this: “over 84% of digital content in Spain is consumed illegally”. We know the demand for torrenting, so we’ll test out various torrenting sites and clients. We’ll test whether the VPN throttles speeds or not. Some VPN providers say it out loud. Torrents allowed! Some VPN providers outright restrict torrenting; your service may terminate without refunds or you may simply receive a ban. They may sometimes pass off your information to copyright holders. For your protection, we dig into their torrenting policies and make sure you’re covered legally. Find the best VPNs for torrenting here. A VPN that invests in their customer support team will generally give you a better experience as a customer. Whatever hiccups you may have, the support team will take care of you. 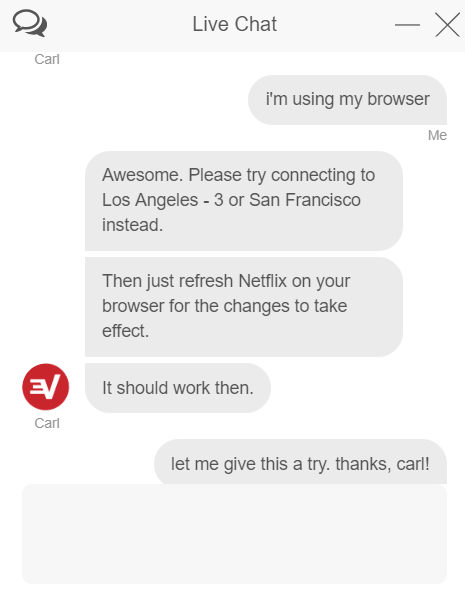 …While others shine brightly like Express VPN whose support help you access Netflix. Ever hear of “KISS”? It stands for “Keep It Simple, Stupid”. A good product is something that everyone can use easily and without hassle. Some VPNs offer advanced options in settings – but even configuring these are straightforward. A one-click solution is fine for casual users. Some power users might want more! We test whether a non-“techie” can handle using the VPNs. What’s the point of a subscription if the VPNs aren’t compatible with your devices? We make sure the product lineup fits various devices and operating systems. Checking for router configuration is an additional step we take to make sure your entire network is covered. Don’t forget about TOR, gaming consoles, Chromecast, Amazon Fire TV and other smart TVs. 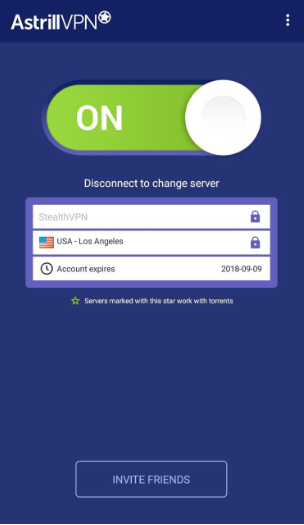 We test the VPN providers through and through. Simply signing up and going over the surface won’t due. We take the extra step to make sure you can get your money back. It’s sometimes a huge pain to get your money back – so make sure to read our reviews and see if your money is safe! During the trial, or sometimes even after, we will ask for a full refund. We will also test how their account cancellation policy works. 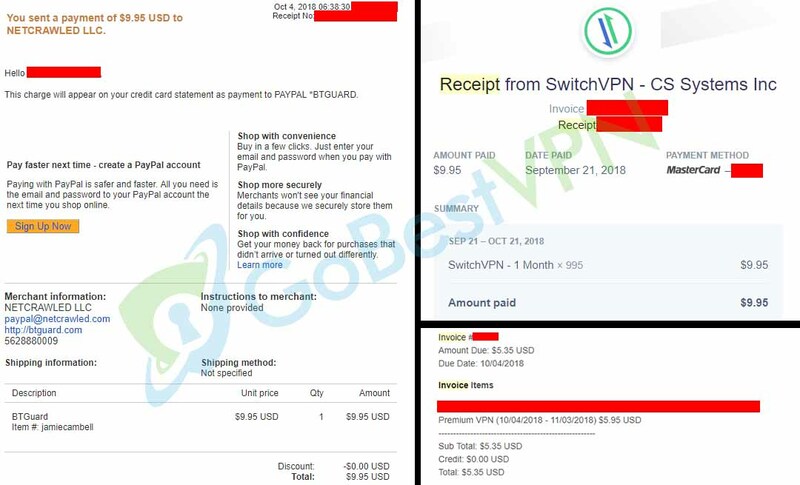 Some VPN providers practice with shady policies, so make sure you read our reviews if you want to protect your finances. The amount of legal text in the VPNs’ logging policies is truly astounding. Notice they said “100% no log” but if you keep reading, they mention they can keep a log on a specific user if a public body requests for it. One does not rule out the other, but more often than not, it’s the former. There are various surveillance alliances around the world. The 5, 9 and 14 Eyes Alliances are the biggest ones, to name a few. VPN providers based in these regions may have to follow local surveillance laws. Meaning, they can keep logs (even while saying they don’t), they must hand over customer data to the governments – and all information is shared between the countries in the alliance. We’re on the lookout for the privacy-centered VPNs and we’ll make sure to spill the beans. If you are an activist or doing anything illicit, make sure to read this information in our reviews. For instance, did you know that the brand-friendly HideMyAss VPN is actually owned by the giant security firm Avast? What seems like a small, fun and friendly brand is actually owned by a megacorp. They don’t have the most user-friendly logging policies. Verifying the legitimacy of the companies behind the VPN brands is a crucial step in our review process. Cost is certainly a factor in your checklist. Let’s remember: you get what you pay for. Sometimes there might be an on-going promotion. 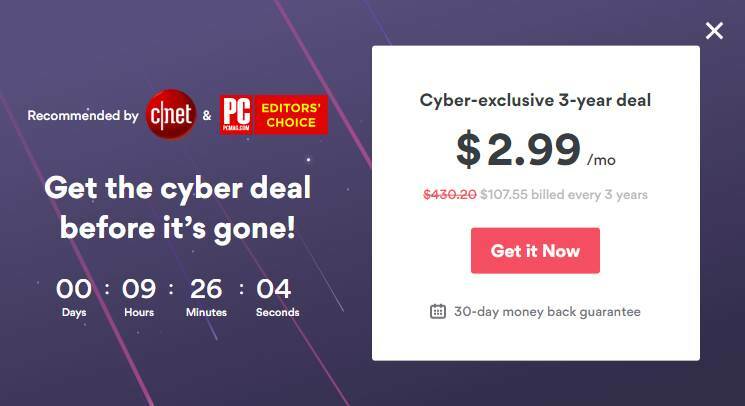 Make sure to check for great deals! Sometimes it’s simply not worth using a free VPN or buying a cheap VPN. We find that the premium VPNs with loads of features aren’t too expensive – somewhere around $5 per month. But sometimes, even the extremely expensive VPNs don’t offer great features. We’re on the lookout for the value you get from the subscription packages. 16. We Admit: We Compare Other Reviews With Our Own Findings! We believe in building a community. This means admitting other reviewers may have some insightful information that we may have not discovered. You read that right. You are the last step in our review process. You are the reader. A real customer. A potential buyer. A disgruntled techie. A privacy advocate. A pioneer. Whoever you are, wherever you are, we’re listening. Please send us all the trouble you’ve had, all the good feedback, or even leave your own review! As you can see, our process is certainly the most in-depth and most extensive in the industry. It takes hard work and lots of time. It’s a never-ending project, really. Thank you for your support and please share our work if you care. The information we provide is free and will remain free – for an unfiltered and unrestricted Internet. Now, enjoy reading the Best VPNs of 2018 List.